Sometimes as a business owner, the best mentor you can have is your father. He can be helpful, encouraging, and sometimes even a little embarrassing. One entrepreneur who knows this all too well is Keenan Williams. When asked about his stepdad, David Pope, the first thing that jumps to his mind is a story about driving to Florida A&M University from his home in Delaware just before the start of freshman year. Pope had married William's mom when the boy was 13 and had simultaneously raised and embarrassed him the way any thorough father would his own son. Their second day on campus was a Sunday and Williams accompanied his dad to a nearby church service. He wasn't surprised when the local pastor invited Pope, a pastor back home in Delaware, up to the stage to deliver the sermon. It's what happened next that floored his son. At the end of the sermon, in front of the congregation of a few hundred people, many of them college students, Pope told his son to stand up. "Turn around son," he said. Williams reluctantly did as his father instructed, then heard his voice booming over the crowd. "If any of you see my son somewhere he should not be or some place he isn't old enough to be, please tap him on the shoulder and tell him he should not be there," he said, not batting an eye. Williams was mortified, yet for the next two years, whether finding himself at a club, lounge, or frat party, he'd often feel a tap on his shoulder and hear the words: "Hey man, you shouldn't be here." William's dad seems to have that way of watching guard over him, even when he isn't actually there. When he called his parents last year to announce he was moving out of his apartment, starting his own company, and getting ready to couch surf across 14 friends' sofas, his parents were not happy. Still they showed up at his New York apartment to tow away his furniture in the back of their Land Rover. Williams couldn't be stopped, and while his dad wasn't thrilled about the decision, he knew not to question it. "I promise you, Dad," Williams said through the rolled down window before his parents pulled off. "This is going to work. I've got a plan." "Work the plan," his dad said to him. "Don’t let the plan work you." And then, before pulling off, he gave him a look that said: "My son's backwards crazy," says Williams. "I don't agree with the way he's going about this, but inside, I know who Keenan is." It's that kind of unspoken, unfettered support that's helped Williams get his business, Rezi.co, which matches tenants with home rentals, ready for its launch happening later this summer. 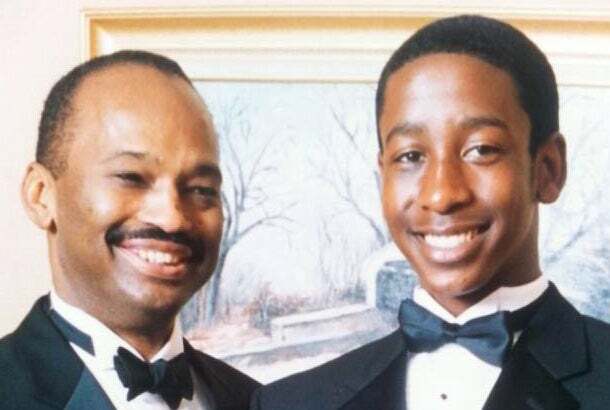 And his dad has also been there each step of the way, texting Williams daily to check in and encourage him to keep pushing through the tough initial months. "I would not be an entrepreneur, bootstrapping and sleeping on couches for a year if I didn't have the lessons my dad taught me," he says. "Not once has he ever told me anything but, 'Keep going.'"